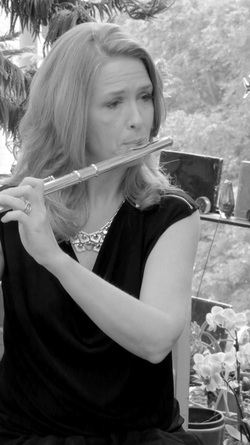 Jennifer Berman began studying the flute at the age of 7 in South Florida. She attended the North Carolina School of the Arts where she received both her High School diploma and Bachelor of Music degree as a student of Philip Dunigan. She then studied at the Manhattan School of Music with Ransom Wilson for her Master of Music degree. ​After freelancing briefly in New York, she became a member of the Civic Orchestra of Chicago, where she was co-principal for 2 years. For both musical and personal reasons, she moved to Connecticut in 1994, where she performs with many area ensembles, including the Hartford Symphony, Waterbury Symphony, Connecticut Virtuosi, Norwalk Symphony, New Britain Symphony and the US Coast Guard Band. She is also active in the choral community, performing as an instrumentalist with the Connecticut Master Chorale, Waterbury Chorale, and Farmington Valley Chorale, as well as the CT Lyric Opera and Opera Theater of CT. She has appeared as soloist with the Albany, GA Symphony and the Rome Festival Orchestra. In her spare time, Jennifer is an avid reader and movie-goer, and blogs at thereelchick.blogspot.com. ​Janet (Campbell) Rosen spent her childhood years growing up on a farm in Woodbury, CT, where she began her musical training on piano. 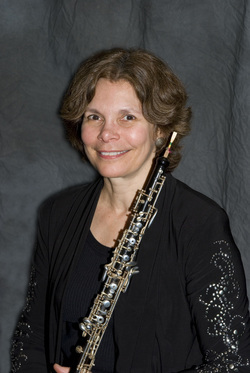 Her family's move to Pennsylvania at the age of 12 gave her an opportunity to study the oboe. She received a B.S. In Music Education from West Chester State College, and a M.M. In Oboe Performance from the Hartt School, University of Hartford, where she was a Concerto Competition winner. Her teachers include Louis Rosenblatt, Robert Bloom and Humbert Lucarelli. She is a member of the Waterbury, Norwalk and Greater Bridgeport Symphonies and is in demand as a freelance oboist with groups throughout the state. 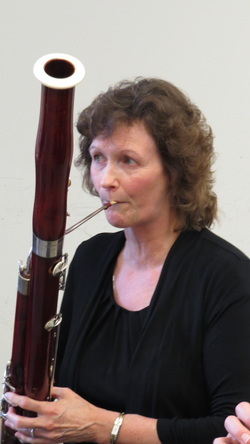 Janet currently teaches instrumental music in New Canaan, CT, is on the faculty of the Neighborhood Music School, and resides in Milford, CT.
Harmonia V is excited to introduce our newest member, clarinetist Jim Forgey! Many of you will need no introduction, as Jim Forgey has been an active performer and teacher in Connecticut since 1992. His musical training includes degrees from Michigan State University and the University of Michigan. His teachers include John McCaw and Kalmen Opperman. Jim is a member of the Connecticut Virtuosi Chamber Orchestra, and The Waterbury Symphony and performs frequently as a freelance clarinetist with orchestras throughout Connecticut. Jim has also been a part of many Broadway National tour productions at Hartford’s Bushnell Theater including, "The Producers", “Ragtime”, “A Gentleman’s Guide to Love and Murder”, "Wicked" and “If/Then”. Jim can be heard on the RCA recording "Dreams" with fellow Clarinetist Richard Stoltzman and has appeared in performance with Mr. Stoltzman at the Metropolitan Museum of Art in New York. As an educator, Mr. Forgey currently serves on the music staff of the Westport Connecticut public schools. He has also held faculty positions at the University of Rhode Island and University of Bridgeport. Sue Cross received her Bachelor of Music from the Hartt School of Music, Masters from Yale. She is currently Assistant Principal bassoon with both the New Haven Symphony and Orchestra New England, along with being and avid freelancer in CT. As an educator and administrator, she is the bassoon instructor of over 20 bassoonists, and 10 ensembles at Neighborhood Music School, in New Haven. In addition as an administrator, she is head of the wind, brass, and percussion departments at the music school, and Director of 2 chamber music summer programs. Sue is also a member of the faculty at Southern CT State University in New Haven. 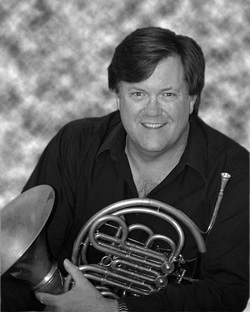 Robert Hoyle began his professional career as a hornist playing on many occasions with the Philadelphia Orchestra at age 19. After graduating from the Curtis Institute of Music as a student of Mason Jones, he toured the United States and abroad performing chamber music. He decided to continue his studies at Yale University and concurrently was awarded the Solo Horn Chair with the Hartford Symphony, a position he held for 24 years. While in Hartford, he was called upon to act as soloist on numerous occasions. When time has permitted, he has performed with the Minnesota Orchestra, the Emerson String Quartet, the Connecticut Orchestra, Bushnell Memorial Productions and many others. Currently he often performs with the New Haven, Springfield, and Waterbury Symphony Orchestras. Harmonia V is his most recent commitment, allowing him to revisit his love for chamber music. Robert currently serves on the faculties of The University of Connecticut and Wesleyan University.